Madison Foley had 20 kills and Ayla Fresenius 16 to lead UNR to a 3-1 win over UNLV in a Mountain West volleyball match Thursday at Cox Pavilion. Fresenius added 20 digs and four blocks and Dalyn Burns 63 assists for the Wolf Pack (8-17, 6-7), who won by scores of 29-31, 27-25, 25-19, 26-24. Mariena Hayden and Elsa Descamps had 15 kills apiece for the Rebels (8-18, 4-9), who lost their third straight. 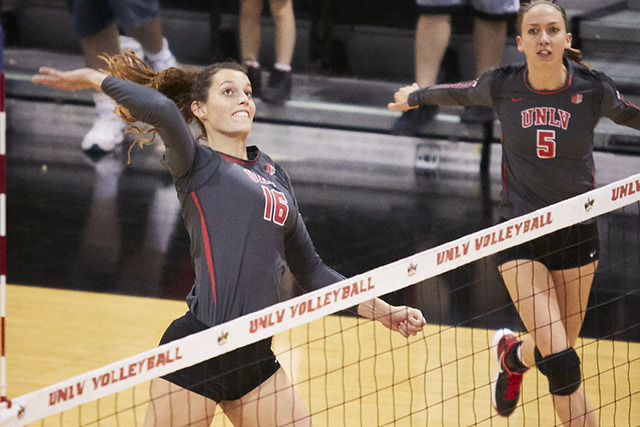 Ashley Owens had 11 kills and six blocks, Riley Jacobs 49 assists and Leka Kiner-Falefa 16 digs for UNLV. Junior Elizabeth Prior was named Mountain West golfer of the month for October, fueled by her medalist performance in the Las Vegas Collegiate Showdown, in which the Surrey, England, native carded a 16-under-par 200 to win by 10 strokes. Prior’s second-round 66 tied for the fourth-lowest single-round score in program history, and her final score tied for the lowest three-round score in program history. She sunk a tournament-high 19 birdies with just three bogeys. The victory was the second of Prior’s collegiate career.